It is human nature to make mistakes, especially when one is undertaking something as overwhelming as a wholesale home redecoration or renovation project. This can be anything from taking a sledgehammer to the wrong wall to choosing the wrong curtains – they can be catastrophic or cosmetic, although to some people the latter might well equate to the former! It tends to be the smaller things – in size, not necessarily function – that escape notice. This is because the bigger, centrepiece items will be foremost in your eyes both literally and figuratively, as they draw the attention. But you ignore these things at your peril, as with just a little more attention you can get seriously increased functionality and style in your bathroom. Now, you are well within your rights to say taps are taps, and that’s the end of it. How much complication can you introduce to an item of such straightforward utility? Well, as in most things, it’s the details that matter. I am shocked that many people still buy taps that use rubber washers. This is the same as using a mangle when we have washing machines (sort of). Ceramic washers are the very best option here as they do not wear out anywhere near as quickly, eliminating those annoying leaks. For extra elegance, why not try a waterfall taps, whose flow imitates that of the natural phenomenon it is named after. Something different,anyway. Toilet seats are another thing that are tossed in the basket (online or otherwise) and fitted without too much of a thought. Thing is, this is one item you will see and use a lot, so why not make it unique by submitting your own design to a company and having them use decals or paint to make it for you? In practical terms, I always counsel getting a soft-close toilet seat, as not only does it protect the pan from damage but it minimises the time you are in contact with what is a germ-ridden item. Win-win. This is all the more pointed now, as November segues into December and the mercury shoots for the nether regions of the thermometer. Heating the bathroom, for me, is non-negotiable, and I will go to almighty lengths to ensure I don’t have to step from the shower into tortuously chilly conditions. 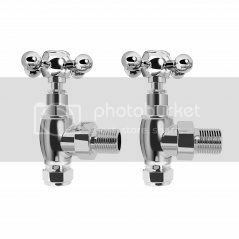 One way to do this is to ensure you get thermostatic radiator valves, which will work to ensure your bathroom is kept to your optimum temperature while minimising your energy use. Plus, the hands-off operation makes for a serious ease of use. Helpful tips that need to be followed by the homemakers. In fact, they need to know the essentials of the bathroom and the kitchen as a whole. I like sinks that are "one piece" - meaning there is are no separate parts. The spaces between the parts, especially the underside, may be areas of fungal growth. I want to have a car and I don't have any idea that there are stuff like this though I know if super foggy but Winter? I don't think I can handle such weather. So complicated! The roads are a lot slippery on winter so extra caution should be exercised. these are indeed the types of things that I truly sometimes forget, I am glad you've shared these ways now at least I can remember them. wow, that bathroom looks very modern, maximizing every space. one of my bathroom essentials now is a bathtub because the kids love warm bubble bath! we really have to save up for home improvement. I love well maintained bathrooms. And choosing the right bathroom fixtures is a must for me. Wow, that bathroom picture is immaculate. Wish mine is that sleek! your bathroom essentials list covers everything. I especially like the last because days when the temps dip down, it's really nice to come out of the shower on a warm and toasty room. Good for wide-space comfort room. But what it is a small area CR, will this idea be applicable. I love the soft,decorative lid! It doesn't feel yucky while you're sitting on the throne. Ha! Ha! Ha! When it comes to the technical repairs in the bathroom, I don't have a say. It is the husband's job. Lol. I am only for everything that's needs to be in there. So when the motif for our bathroom is pink, blame me! And my girls. The husband is the only "he" in the family and I am just glad that he doesn't mind it if the rugs and many others are pink. LOL. This post reminds me of the Sanitation Hackathon sponsored by World Bank last year. I for one loves a tidy and clean bathroom. Everything in there should be working perfectly. Heated water is very important to me too. So we are glad that we don't have problems with our radiator or heating system.